Sand Trap Louvre | TROX Malaysia Sdn Bhd. The sand trap louvre is used as pre-filter for the protection of air conditioning plants in areas exposed to extreme levels of industrial pollution. It has a high degree of separation of sand and large dust particles, even in cases of high dust concentrations. 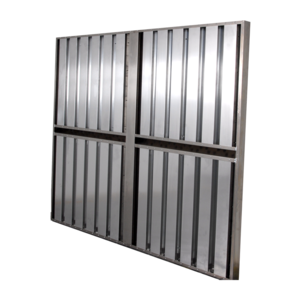 The vertically arranged sections and holes for sand drainage ensure the sand trap louvre is self-cleaning and maintenance-free. The sand trap louvre is designed to separate large particles at low air velocities, thus avoiding excessive dust loading of conventional filters. It is not intended as a substitute for conventional supply air filtration plant.